Why are some kinds of content and some forms of presentation such standard fare? Publishers may be economizing or updating what is considered reliable material. Here it is interesting to note how examples differ among volumes. Here it is interesting to look at the relationship of content to presentation; a book that adopts a certain graphic language also adopts the social, historical and cultural meanings associated with that language. Similarities in content and design reflect the social and historical conventions that surround book design and publishing. 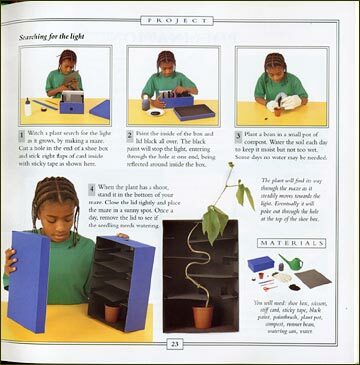 Several activity-related books about trees, published between 1972-1997, were studied for comparison with other non-fiction books and plant biology school texts. Despite their varying publication dates, much of the content in these books is similar. 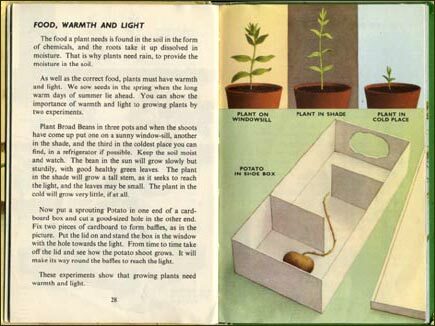 Two simple activities, which I refer to as the potato box and the leaf rubbing experiments, surfaced in many different forms. 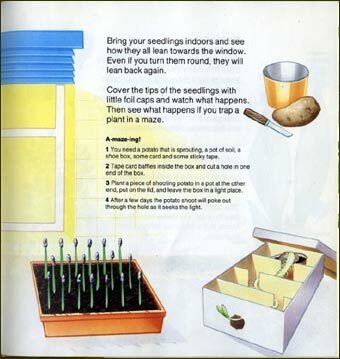 pp 28-29 of Plants and how they grow by F.E. Newing and R. Bowood, Loughborough: Ladybird, 1965.
p 11 of Plants in Action by Robin Kerrod, Bath: Cherrytree, 1988.
p 23 of Trees (Learn About) by Peter Mellett, London: Lorenz, 1997.